Pre-Press articles are publication preceding the print publication. 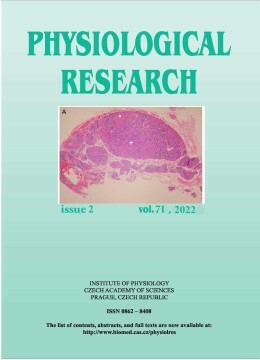 This pre-press version are accepted, reviewed papers published in manuscript form before they are copyedited and published in the printed issue of the Physiological Research journal. Articles are published online in the PDF format after the acceptance. The online pre-press version of the article are searchable in Medline and are citable. In Medline database, it will appear as [Epub ahead of print]. Final print and online publication could differ slightly from the pre-press version as a result of copyediting. After the journal issue is published in print, the final version of the article will replace the Pre-Press version. The author will receive an acceptance letter together with request for the final version of the accepted manuscript. Once you decide that you want your paper to appear on-line in the Pre-Press articles, send a final pdf version of the accepted paper and confirm the title page information. It is important that the author and title information is correct, since it will become part of the paper's permanent record in Medline. · Please note that no changes to authorship order or addition or deletion of authors' names will be possible once an article appears in Pre-Press articles. · Be absolutely certain that the PDF you upload is the final, accepted version of the manuscript and that it includes all figures and tables. Once the article is published in Online-Only articles, this version is closed and no corrections to the PDF can be made. If you notice an error that you feel must be corrected before the final publication online and in print, please e-mail the Journal Editorial Office. Always indicate the manuscript number and the first author name. Authors will have the opportunity to make essential changes in the final version. Pdf files of pre-press articles are on Accepted Papers page.